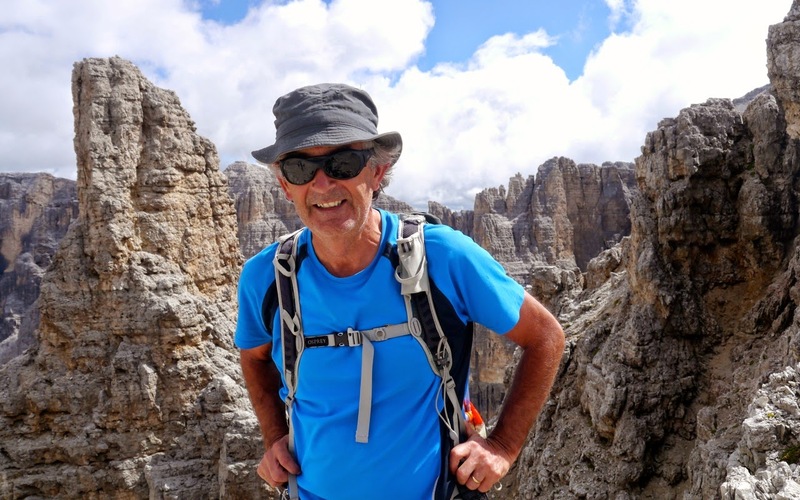 Continuing with our 'no-dormitory' strategy, today we crossed from the northern side of Sella Ronda to the southern side in one go and are now relaxing in a hotel at the Passo Pordoi. It was another spectacular day with great weather and huge scenery. It was also fairly tough going, especially after a big day yesterday. 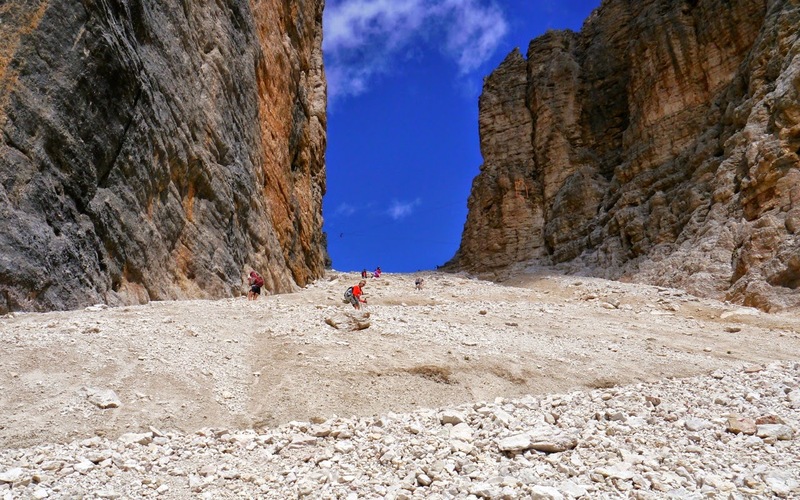 We left the little roadside auberge at 8.30 and were soon climbing steeply up a deep and dark gorge right into the heart of the Sella Massif. After an hour of steady climb we had to pull ourselves using fixed steel ropes up the cliff at the gorge end. The fixed rope climb was about 200m, something that would have felt pretty intimidating at the start of the this trip but now, after what we have done, went like a breeze. At the top we bumped into two young Germans we had met several times before who were also doing Munich - Venice. They had stayed in the huts on this stretch before and, like us, were putting in long stretches to avoid them. After the big pull up and the 500m height gained we could see most of yesterday's route laid out to the north. 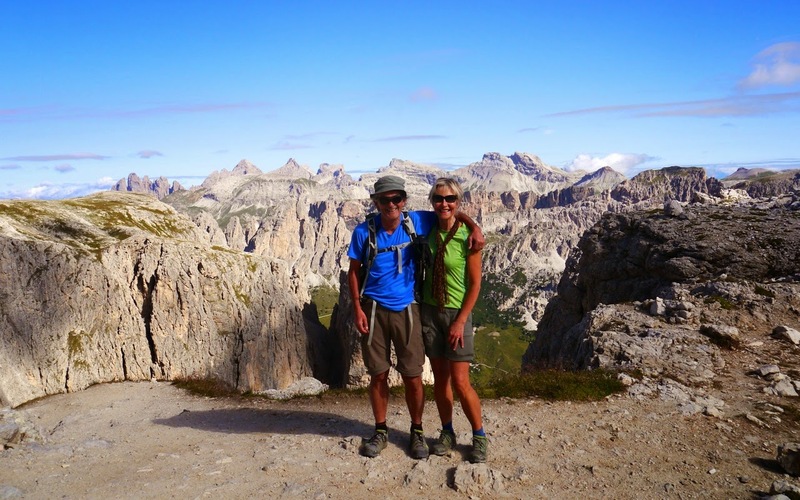 After a hut stop for coffee and strudel we set off up another gorge cut into the massif cliffs of Sella Ronda. 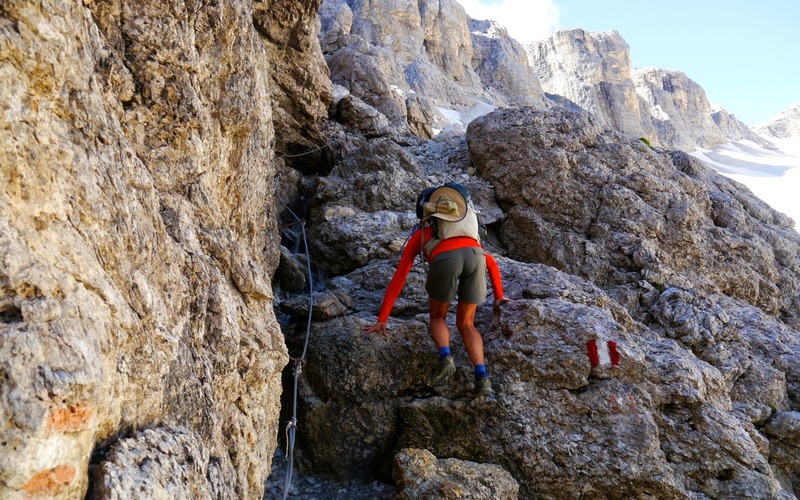 Some more fixed ropes and soon we were making the final trudging steps up onto the Höchster Punkt which, at 2962m, is the highest point on the whole Munich Venice route. 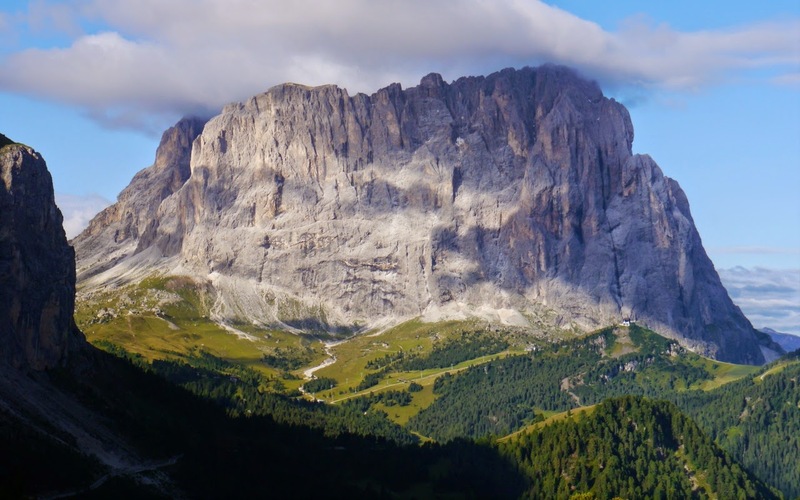 It's the edges of the Sella Ronda, the huge limestone cliffs and their pale rusty colour that make it so special : it's perhaps best viewed from a distance. 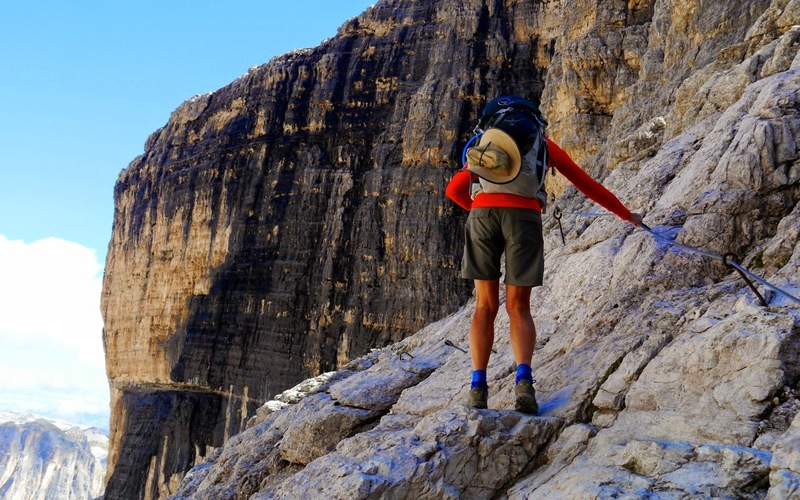 To be honest the top itself felt was less than beautiful, a barren stoney waste that felt desolate and windswept. What's more, after the peace and quite of the walking so far we suddenly found ourselves in the company of lots of others. 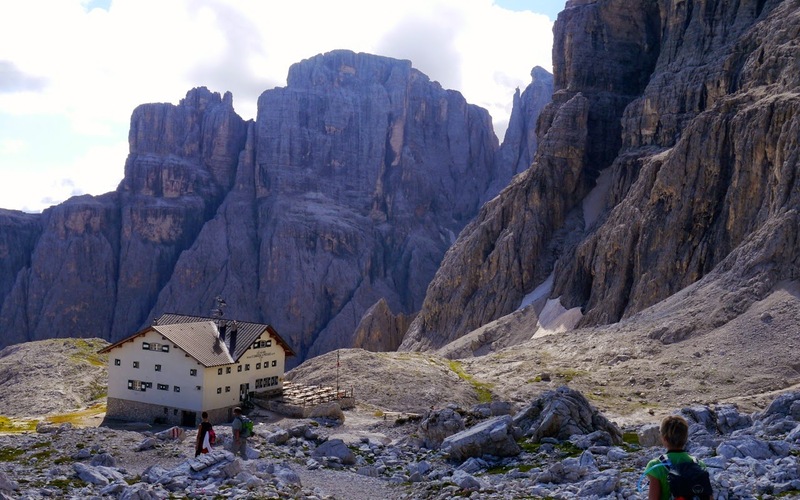 The Rifugio Boè, set in an amazing location and where we had once planned to stay was packed, and clearly the target for hundreds of day trippers coming up by cable car from the Passo Pordoi. It was a shock to see so many people mooning about and it put us off a bit. I'm sure if we had turned up later the crowds would have disappeared and I would have been less grumpy. Pressing on we reached a hut near the cable car and had a very pleasant lunch. 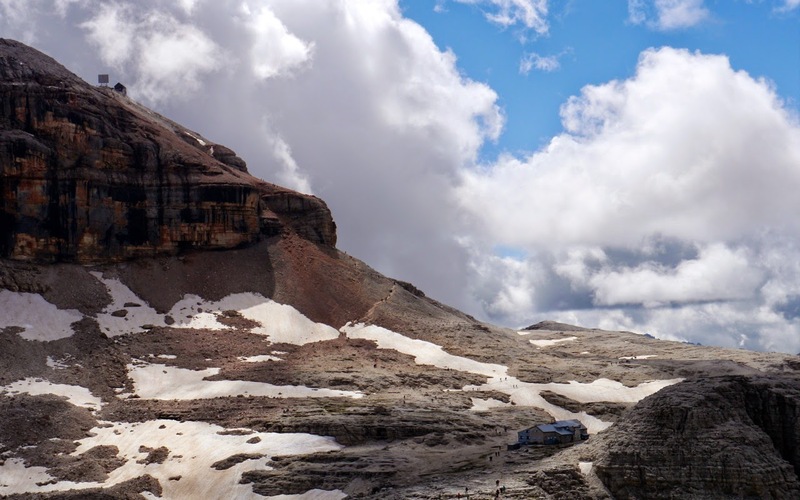 We could have stayed there but why would we sleep in a dormitory when there is reasonably priced hotel accommodation 600m down the mountain below? 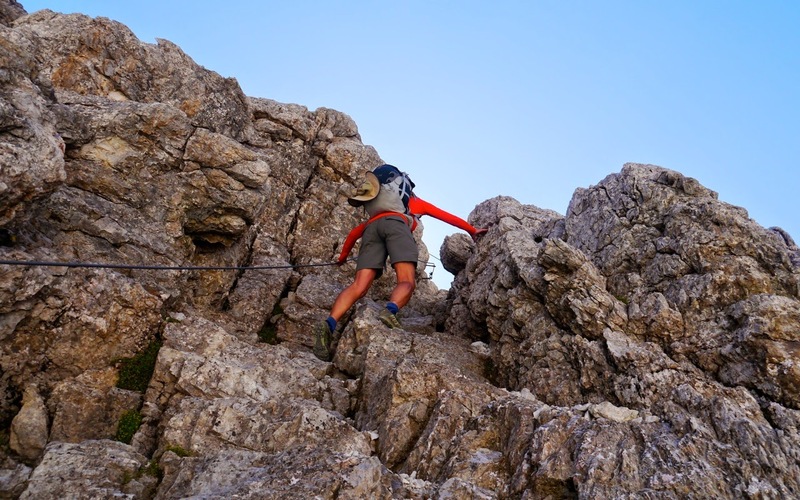 Actually the descent was a tough one, very steep and down scree that in places had been rubbed bare to the rock. The young and super brave - probably the same people who ski straight down blacks - were running down but as we were much more cautious. Even then Christine slipped, fell on her super lightweight walking pole and managed to snap it. 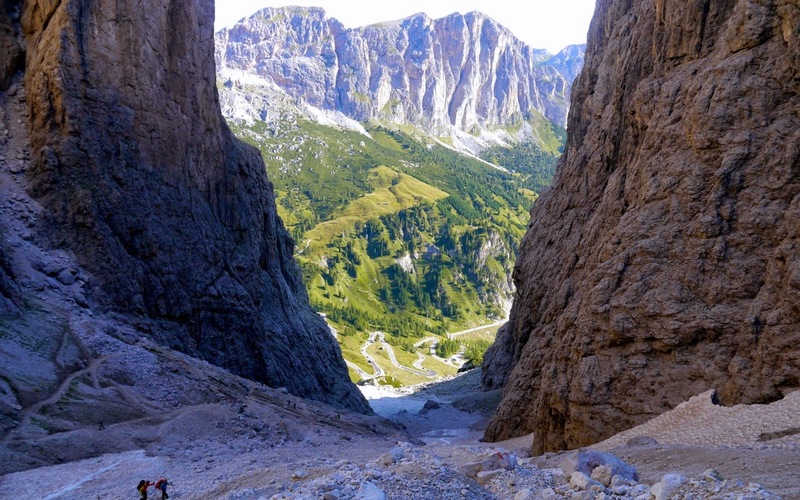 Passo Pordoi has a road winding up to it from both sides and is a destination for motorcyclists and cyclists alike (it's regularly used as part of the Giro d'Italia). It was great fun having a beer and watching everyone coming and going in their designer biking gear.